1) To make the dough, mix the 1/3 cup water, flour, yeast, and sugar in a large bowl and let it sit for 30 minutes. 2) Add the flours, baking powder, salt, sugar, and oil. 3) Mix while slowly pouring in the 1/2 cup water until it just starts to form a dough. 4) Knead the dough until smooth, about 3-5 minutes. 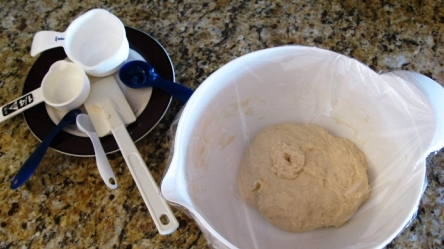 5) Place the dough back in the bowl, cover with plastic wrap and let it rise for 3-4 hours. 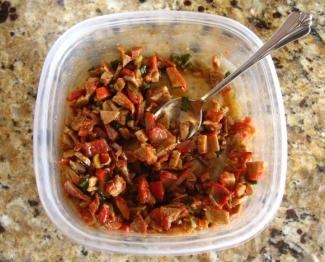 6) Mix the pork, green onions, soy sauce, hoisin sauce, honey, wine, sesame oil, and Chinese five spice. 7) Sprinkle the baking powder over the dough and knead it well. 8) Roll the dough into a log and cut it into 12 equally sized pieces. 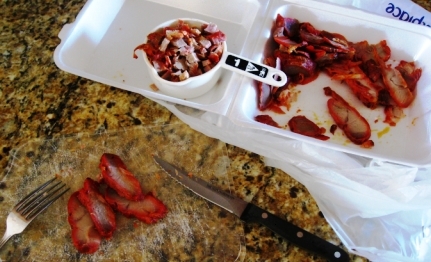 9) Roll each piece into a ball, flatten with a rolling pin, and place a tablespoon of filling into the center. Pinch the dough on both sides, and then pinch the dough on the top and bottom. Pull the four pinches up to the center and given them a little twist. 10) Place the balls on squares of wax paper, cover and let rise for 30 minutes. 11) Place the balls into a steamer, without touching each other, and steam for 10 minutes. I don't have a steamer per se, but my rice cooker has a plastic steam rack. 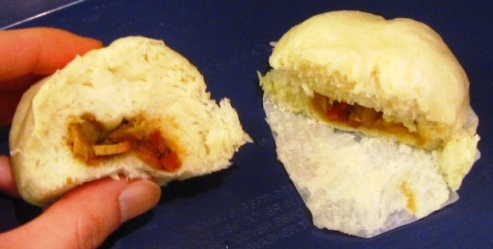 I dumped about 2 inches of water in the rice cooker and placed the buns + wax paper in the steam rack accessory. I waited till I saw steam coming out of the rice cooker (maybe 30 minutes?) before I started the 10-minute timer. Oooh these look delicious. I too am a lover of the Asian cuisine. I favour Japanese but Chinese, Cantonese etc still make it high up there. Japanese is one of my top favorite genres too! I can't believe I didn't discover sushi until college, and now that I'm pregnant, I'm limited to low-mercury, fully-cooked seafood. First thing I'm going to do post-pregnancy is go on a sushi/sashimi binge! Sushi is just YUM. My Lad loves the stuff. Shame its so darn expensive. I may have to give something out of my wagamama cookbook ago.